If betting were legal in the United States, there still probably wouldn’t be many lines for track and field at the Olympics due to general lack of interest, but at least you could find some of the following recommendations actionable. 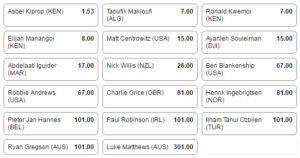 House of Run’s Kevin Sully and the Daily Relay’s Brendon Desrochers took a look at the SportsBet.com odds for track and field in Rio and have chosen their five favorite bets. The odds come from Australia, so if you’re abroad, feel free to put your money where our mouths are, but don’t send anyone to break our thumbs if it doesn’t work out for you. Ed. note: After this article was published, the odds were corrected to reflect the accurate translation from the decimal odds. It wasn’t that long ago that Tufa was best known as that other woman who went out on an early breakaway with Buzunesh Deba in windy conditions at the 2013 New York City Marathon before fading to eighth. Since then, she’s finished first (in 2015) and second (in 2016) against “the greatest fields ever assembled” in London. 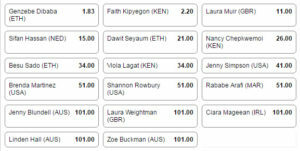 No one in this Olympic field is better than 3-to-1 to win (that’s 2015 World Champion and Tufa’s teammate, Mare Dibaba), so the oddsmakers see this as a wide-open race. Though Tufa’s never gone under 2:20, this race probably won’t either, so I’ll take her experience against deep fields at these odds. Kevin’s Take: I agree. 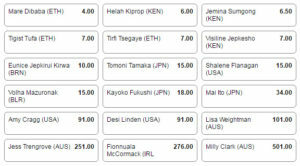 I can’t really differentiate between Tufa, Dibaba, Tirfi Tsegaye and Jemima Sumgong. 6-to-1 odds for someone who is one of four who can win? I think that math holds up. Also interesting to note that Shalane Flanagan is 14-to-1, while Amy Cragg and Desiree Linden are 90-to-1. 90! 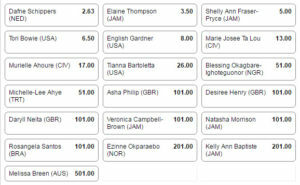 I’m guessing SportsBet.com didn’t watch the Olympic Trials. Based on last year’s World Championships and her consistency this season, Dafne Schippers is rightfully the favorite at 2-to-5. But putting Bowie at 5-to-1 (also behind Elaine Thompson at 2.75-to-1), isn’t giving her enough credit. 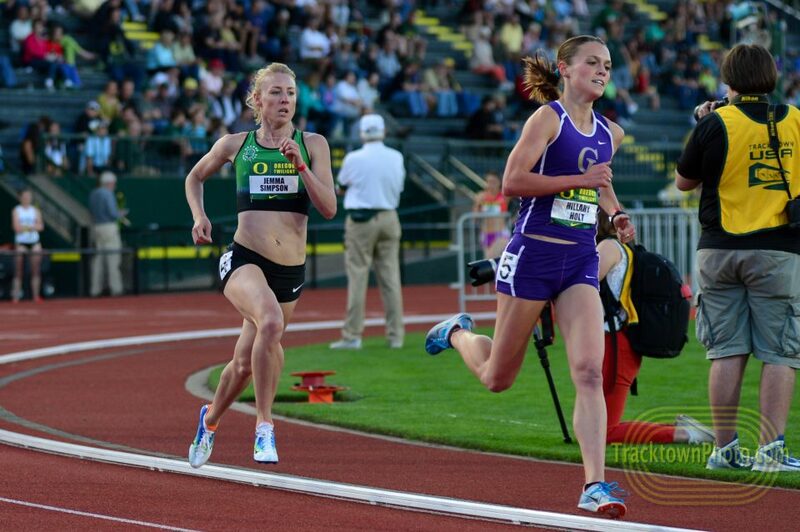 She beat Schippers at the Pre Classic and her season’s best is only .06 slower. Brendon’s Take: On the one hand, I worry about Torie Bowie in her sixth race of her first Olympics. On the other hand, we saw her perhaps affected by nerves in the 100m final at Trials and run better in the 200. She first made her professional mark in a 200 — from Lane 1 — and I think this is her better event. 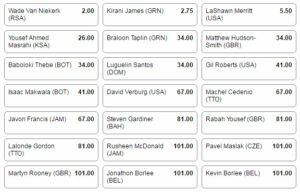 In this field fifth choice among the oddsmakers seems fair for Kynard, who just feels less explosive than the men in front of him, Mutaz Barshim and Bohdan Bondarenko in particular. What I’m betting on is Kynard’s consistency on the Diamond League circuit this season as well as his Olympic experience. He’s finished first once and second twice in his three Diamond League appearances in 2016, and he won silver in 2012. Kevin’s Take: The high jump has been very unpredictable this year. That said, I’d probably take Guowei Zhang at 6-to-1 if I had to make a pick. This is an actual bet you can make. He’s one of four men to run 9.88 or faster this year. It’s not a stretch to call him the favorite for bronze. And yet, three others have better odds than him in this hypothetical race where you cover up the two fastest people in the race. In general, the odds for all the events tend to give a large amount of weight toward last year’s World Championship results. Those results are obviously important. They give an insight into how an athlete performs at the most important part of the season in a high-pressure scenario. However, an athlete’s current form is probably more important. We know Vicaut is in great shape and is capable of running under 9.90 on Sunday. Not so with the others ahead of him. Brendon’s Take: This oddsmaker has an inordinate amount of respect for Yohan Blake. 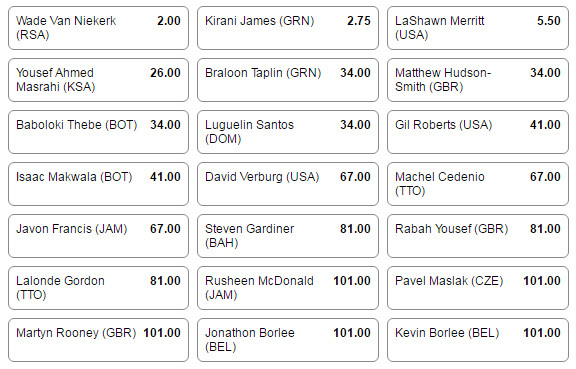 If a close observer of the men’s 100 is ranking the world’s best this year, is Vicault worse than fourth? That means he’d just have to beat Trayvon Bromell and stay in front of a bunch of guys he’s been faster than to make this bet pay off. In two of the last three major championships, Simpson failed to make the final (London 2012) or had her shoe fall off mid-race before finishing 11th (Beijing 2015). She also has just the 11th-fastest time of the year (4:01.57). Still, this is a huge number for someone who has a Worlds gold (Daegu 2011) and silver (Moscow 2013) to her name and who appears to be at or near top form. 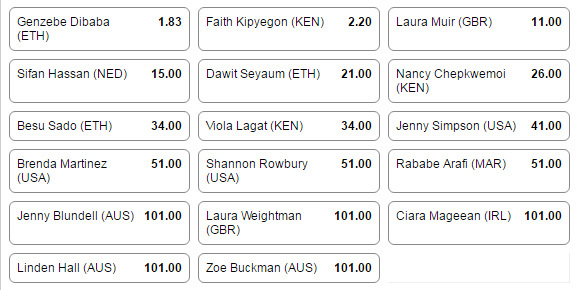 It might take a strange race for both Faith Kipyegon and Genzebe Dibaba to be beaten, but I think that happens far more often than once in 40 races, and Simpson is among the best positioned to take advantage at this unpredictable distance. And who knows what state Dibaba might be in after leaving the track in a wheelchair earlier this summer and being near the center of a PED investigation? Kevin’s Take: What are the rules of when first place is determined? 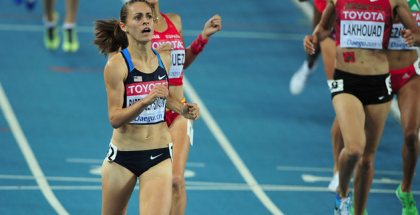 With the history of the women’s 1500m, someone in the semis might end up with a medal. If it’s just based on who crosses the line first next Tuesday, then 40-to-1 might be right. 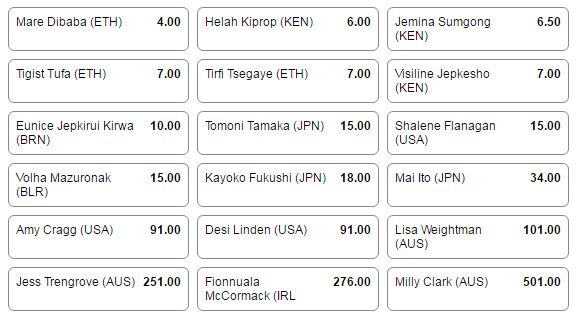 You have an enormous favorite in Dibaba, plus a loaded field behind her. He was a late add after Marquis Dendy had to withdraw with an injury. He’s jumped wind-legal marks of 8.34m and 8.29m this year. The men’s long jump is incredibly hard to forecast, but I think Hartfield is being undervalued because he finished fifth at the Olympic Trials. Brendon’s Take: I like the strategy of picking a longish shot in an unpredictable event. Last year at Worlds, after having the third longest jump in qualifying, Hartfield was the only finalist to no-mark. He’s also finished third, fourth and fifth in three U.S. qualifiers for major championships, so I wonder about him being able to come through in a big moment. Asbel Kiprop is the favorite and rightfully so, but doesn’t it seem like Souleiman could win this race more than once in 14 tries? First off, he’s an 800/1500 guy, which means he should be able to kick off what likely will be a moderate pace. Second, though his season’s best is just sixth in the world this year, he did not compete in the year’s two fastest 1500s — Monaco and Birmingham (though, really, only Kiprop ran fast in the latter). 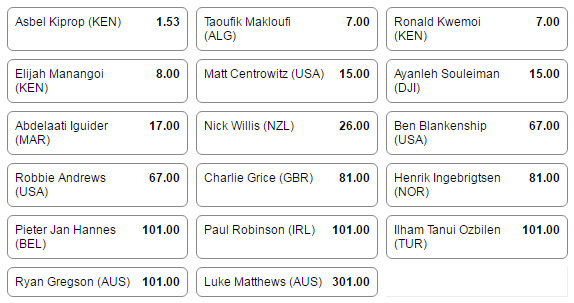 If it goes out slow and he’s in form, I would take Souleiman over any non-Kiprop in the field. 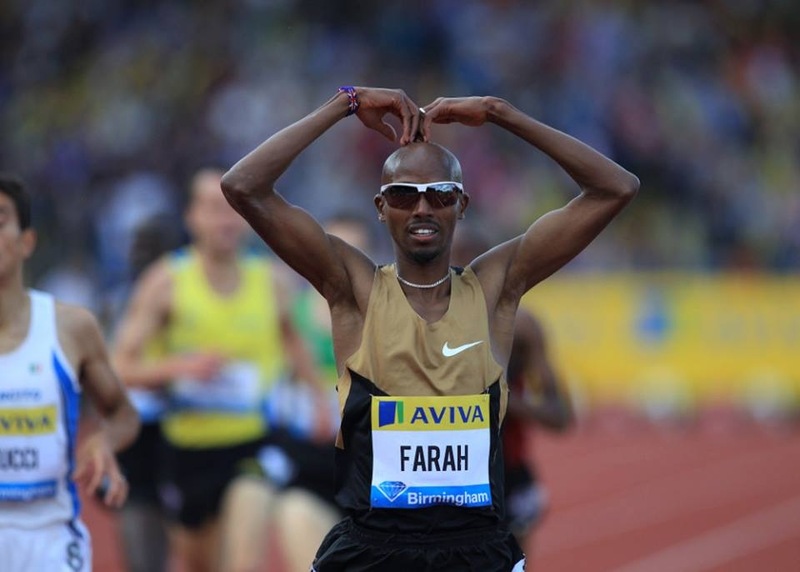 He’s another Jama Aden athlete who has raced sparingly in big events, so his form is something of a mystery. Kevin’s Take: As the numbers suggest, this is much more plausible than Simpson. I like the pick — he’s won big races before and the slow pace will keep everyone involved. Not a huge payoff here, but I think it’s crazy that Merritt is third behind Wayde Van Niekerk (even money) and Kirani James (1.75-to-1). Merritt has the world lead in the 200m and the 400m. At worst, he should be even with the other two. The 400m comes first in Rio so he will be at his best. Brendon’s Take: I don’t think it’s that crazy that Merritt is third, but I do think it’s crazy that his odds are twice as long as James’. The Grenadan has finished behind Merritt at the last two major championships and hasn’t raced as well or as often as Merritt this year. Elaine Thompson ran a 10.70 in Kingston two days before Gardner’s 10.74 in heavy (but somehow legal) winds on the fast track of Eugene. That Thompson’s odds are better than Gardner’s is therefore not a surprise. What’s a bit more surprising is that Dafne Schippers is the favorite, despite five other women having broken 10.80 this year while her season’s best is 10.83. Still more perplexing is Tori Bowie having lower odds than Gardner despite being well beaten at the Trials. Gardner may indeed finish fifth in Rio (she’s listed behind Shelly-Ann Fraser-Pryce as well), but she seems to be well undervalued. Kevin’s Take: I think Gardner and Fraser-Pryce’s odds should be flipped. 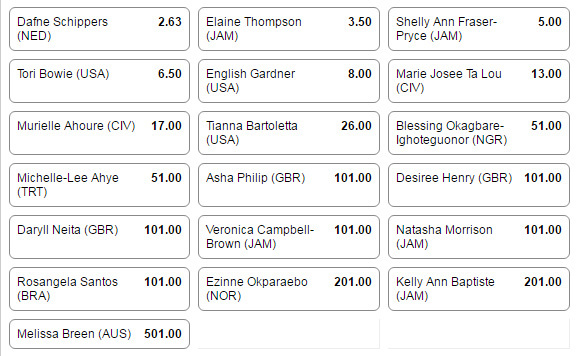 Fraser-Pryce is at 4-to-1 and that’s way too high, even considering her ability to rise from the ashes each summer. The race looks to be among Schippers, Gardner, Bowie and Thompson, and it will be very close. I like this pick. I wanted something with double digit odds for my last pick. Other nominees for this top five included Tianna Bartoletta at 9-to-1 in the8ong jump and Michael Tinsley at 10-to-1 in the 400m hurdles. I chose Lagarde partly because of the longer odds and also because of the ability of the high hurdles to go completely sideways in a hurry. Omar McLeod is the favorite, but he is beatable. After that, it’s an enormous jumbled mess. Of the runners who are competing in Rio, Lagarde has the fifth best time of the year. Brendon’s Take: This was on my short list of potential selections as well. PML has been plagued by injuries but still finished third and second in his last two Diamond League races. It’s not hard to imagine his best times this season coming in the Olympics, once he’s further removed from injury. 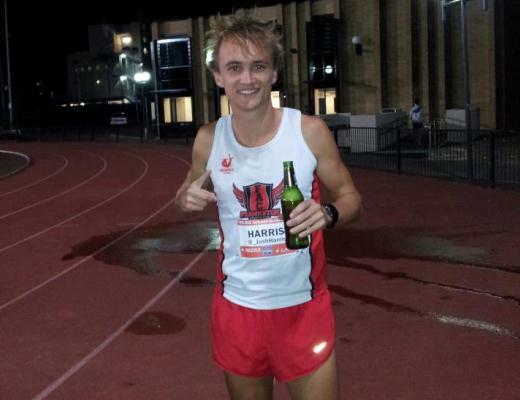 His season’s best of 13.17 is just the 17th fastest time in the world this year, but when he ran it — with his spot in Rio secure — he said, “Now I removed the sword of Damocles to Rio over my head.” So maybe that sword was slowing him down.